DC Comics's tie-ins to their burgeoning line of CW television series have improved as they go. Digital was obviously a godsend to these types of comics, an improvement over the awkward mixing of comic and fan magazine from back in Smallville's heyday. The Arrow digital tie-in comic series that I first sampled felt too-purposefully toothless, spinning middling origin stories so as not to step on the television show's toes; Flash: Season Zero improved on that (and I understand later Arrow comics have been better, too) in telling longer and more relevant stories, though the occasionally collision with the television series continuity still grates (see Flash: Season Zero's proto-King Shark King Shark story). 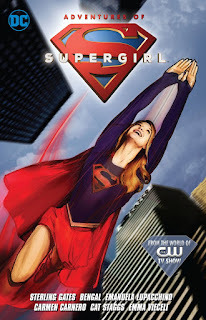 Next up is the digital-to-print Adventures of Supergirl, which has at its start the distinction of being written by Sterling Gates, whose own in-continuity Supergirl run clearly served as a template for the present TV series. Following the Flash comic model, Adventures of Supergirl tells an episodic, connected story rather than relating self-contained shorts, and, at about half the size of the Flash book, reads as very organized and put-together. Gates has no problem here capturing the voices of the television characters and his enjoyment of the material is palpable. All the lessons learned from previous DC digital tie-in series result in Adventures of Supergirl being the best of this genre so far. The story within Adventures of Supergirl is no slouch, but I want to make mention at the beginning of Gates's in-jokes here. At their most mild are shout-outs to a couple of past Supergirl creators by way of side-characters' names: "Igle" refers most certainly to Gates's former Supergirl artist Jamal Igle, and "Stern" is probably Roger Stern, who wrote a couple of the Matrix-Supergirl's adventures in the 1990s. More hilariously overt is that the book's alien out of the gate is the Byrnian Rampage, nee Caren Falq-Nerr, a tribute to John Byrne's Rampage Kitty Faulkner from the 1980s post-Crisis on Infinite Earths Superman series. But best yet is late in the book when Kara battles a version of the classic Supergirl villain Psi in a dreamscape, and sees depictions of herself including the Peter David Supergirl (both the later depowered and Earth-Angel iterations), her Red Lantern costume, and her recent Crucible armor, drawn by that book's artist, Emanuela Lupacchino. Gates also mentions a dream where Supergirl defends Earth from a legion of Kryptonians alongside Superman, a reference to Gates's own New Krypton tie-ins -- wonderfully positioning his own previous Supergirl work as a Newhart-esque semi-in-continuity TV Supergirl dream sequence. These tributes to Supergirl adventures past would mark Gates as a true Supergirl fan if such weren't already well-known, and the readers' sense of Adventures of Supergirl as a labor of love makes this book more than "just" a tie-in. The third of Gates's "hench-villains" (serving the book's big bad, Facet) is one Vril Dox. Though Gates toes tenuous ground in that the Supergirl TV show already has a Brainiac in Laura Vandervoort's Indigo, the characters are ultimately satisfactorily different. Moreover I appreciated that aside from being green and having a penchant for wearing purple, Gates's Vril Dox isn't in love with Supergirl, doesn't have any Legion tendencies, etc., things that I feared might overcomplicate this story (and distance it from Supergirl TV continuity) when I first heard about it. Aside from Gates's good time, another striking thing about Adventures of Superman at the outset is the variety of artists. The book kicks off with Bengal's rather animated work, which is attractive and a nice change, and then Jonboy Meyers offers an equally outside-the-norm manga-inspired style. I'm thrilled by the variety, with the only downside being that it's a little harder to hear the characters' voices via Gates in the beginning when Begal's Supergirl, for instance, looks considerably younger than her on-screen age. Later artists include Lupacchino and Cat Staggs whose work is no less enjoyable but more traditional; however the greater realism then makes Gates's characters easier to "hear" in their TV voices. With no disrespect to Steve Orlando, whose Rebirth Supergirl I haven't read yet but hear it's good, I was disappointed not to see Sterling Gates's name associated with that series, or really with any Rebirth series. Adventures of Superman is not a passable substitute for Sterling Gates back in the DCU, but it is a good TV Supergirl story, and indeed even better than I expected from how these usually go. I'd read a sequel if DC was so inclined. If they're not giving Gates a Rebirth ongoing, they should at least have jim join the Supergirl TV show's writing staff. C'mon, president Johns, hook a brother up. Oops, I meant "him" (Gates), not "jim".